From Cold Lake is the latest serialized show from the creative team behind Kapow-i GoGo and Puffs, inspired by radio programs like Garrison Keillor’s Prairie Home Companion. With episode 2 premiering on September 12, I sat down with the cast and creative team behind From Cold Lake to talk about small town life and why serialized storytelling is seeing a resurgence. In From Cold Lake, Patrick McCartney plays a well-meaning Midwestern dad who likes hunting and a cold diet beer (for the calories!) but struggles to connect with his son. In real life, though, McCartney prefers the darker side to Middle America, and in our conversation, we discuss his love of David Lynch and why Twin Peaks and Fargo are his kind of small towns. 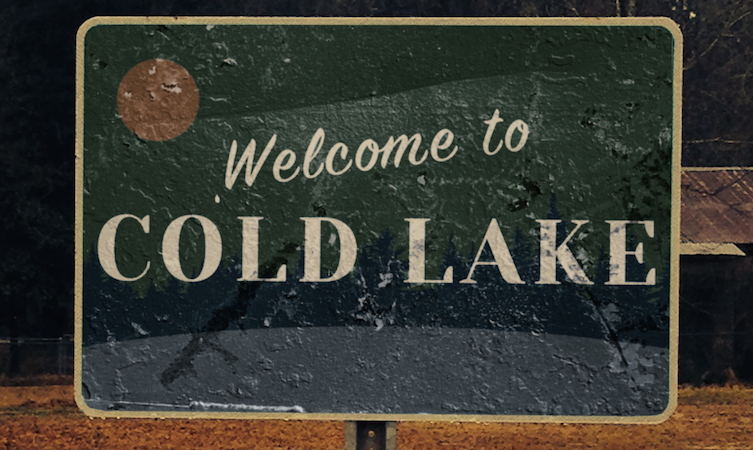 What is From Cold Lake, and what would you say is your role in it? Well, From Cold Lake is a radio podcast play that’s about a small town in Minnesota and the people in it, and I’ve only done the first script, but as I understand, it gets weirder. I play Bob, who is the father of a young man who doesn’t quite fit the small-town criteria I have as far as guns and certain sort of average American boy behavior. Traditional masculinity, exactly, and I’ve also been doing the announcer who just wishes he was on NPR. Small town tales have always been part of our popular culture as Americans in Garrison Keillor’s Tales from Lake Wobegon, Welcome to Night Vale, Stars Hollow in Gilmore Girls, what do you think, specifically for New Yorkers, is the appeal of something like From Cold Lake? That’s a great question. I’m from New York City, so as far as small town stuff, I go right to Twin Peaks. That’s where my brain goes. Whenever I’m in a small town, that’s what I’m thinking about is how weird it can get, and Fargo, of course, is a great example. For me, I’m fascinated by the underbelly of what happens in small towns. Being in New York, being a New Yorker, I feel like Woody Allen every time I’m in a small town, and I feel like everybody can know my business. It fascinates me how people live in that environment because I’ve never lived in that environment except, you know, for a few months here and there. It’s only been New York, Chicago, and Los Angeles as far as well I’ve lived. Where exactly in the Midwest or Minnesota have you had a chance to visit or spend any time in? Well, when I was in Second City, we did – oh no, wait. That was St. Paul-Minneapolis. That was Minneapolis. Yes. Well, Chicago, I lived in for ten years. That’s as Midwest as I think I got. We toured the country, and we played a lot of Midwestern places like Ohio, Indiana – but I’ve spent some time in Wyoming in a very small town. So my Midwest experience is primarily Chicago, which is why my accent always drops into Chicago. What would you say is the key to the perfect Minnesotan accent? Well, I think it’s just, as far as an actor, having the courage to just go for it. I always think of William H. Macy in Fargo. His accent was so spot-on and not distracting because he made it his own completely. So that’s my point of reference, Macy, for sure. It’s still hard, though. I still drop into Chicago. I talk to Colin, I’m dropping into Chicago. It’s at least closer because I could drop into New York easily. What is the rehearsal process like for you, for doing something like From Cold Lake that is a very quick turn around? I mean, as far as when you get the script, as opposed to doing something that’s a bit more traditional. Well, it’s fun because you get to make fast choices, and there’s not much thinking about it. It’s tricky because it’s a radio experience, so I like to use my body as an actor a lot. The one thing I’m learning as a performer is how to use the microphone but also present it to an audience, which is a whole way of thinking that I’ve never really explored as an actor before. So that’s fascinating to me, and I haven’t heard what it sounds like, but hopefully, I’m getting whatever I can get across using my body in my voice and then making adjustments to be minimalist with my body. It’s tricky. It’s a challenge, and I enjoy it. I enjoy being challenged. I would say that’s something I really admire in actors that can do that, that can really convey as much with just their voice. Yes, I admire it too. Yeah, it’s a whole skill set. People I know who make a living doing reading books and stuff, and I’ve been approached about that kind of work, but I haven’t really explored it because there is a real art to it. It’s a lot harder than it seems. Yeah, there’s a lot of actors that can’t necessarily do that. You don’t know it until you hear them try it. I remember hearing an actor. He’s on Scandal, he’s her dad. He did a reading of Freedomland. I was listening to it once when I was driving from Wyoming to Los Angeles, and it was amazing. Like, every character, it was astounding, dropping right into the world. I was going to say, that’s my favorite thing now. I take the bus and a subway a whole lot, living here, and I love listening to podcasts, especially these longer-form podcasts like Welcome to Night Vale. Oh, you haven’t heard of Welcome to Night Vale? Oh, goodness. It’s this wonderful show. Think of Tales from Lake Wobegon but imagine it’s in this weird world where the news of the day is that a portal opened and monsters came into the town. There’s a whole episode that’s about the local library and how the librarians are monsters. Wow, and how’s the writing? The writing is amazing. They put out a book actually just this past year. Really? I’ve been listening to – podcasts are kind of new to me. I know a lot of comics that do podcasts, and I’m very wary of listening to stuff about comedy. I will say Horatio Sanz has a great show, which I’ve listened to. Serial really turned me on, and so I’ve been doing a lot of true crime stuff. True Crime Garage is really interesting. It’s just two guys in a garage in Ohio somewhere, and they go through the details of these true crimes without much of a solution or any sort of theory, but something about it makes me want to listen to it every week it comes out, which I think is like the thing, the challenge. Also, sort of imagining these two guys who I have no real image of in the middle of a winter in Columbus, Ohio in their garage doing it. Just that is enough for me to be like, this is interesting, talking about true crime. Not to mention that there isn’t a whole lot of money in podcasting. You do it out of the passion of it. Right, which is why you should have a subject you’re really excited about. Unless you’re someone that’s big enough that you’re touring around and doing live shows or something. Right, right, right. Yeah, I know people that have done that and then I know people who just do celebrity interviews, and it all seems cool to me, but I like it when it’s something different. Well, Welcome to Night Vale is definitely something different. Yeah, I’ll have to check that out. And it’s really wonderful too because it has that small-town radio feel to it. Like, the whole first episode is about that a scientist has moved to town and everyone is fascinated with this guy Carlos, Carlos the scientist with the most beautiful hair. Nice! (laughs) Kind of like Chocolat, with Johnny Depp moves to town. Yeah, a little bit, yeah. Another question that I had was the longer-form storytelling and the rising popularity of it. This past summer, a lot of the big blockbuster movies have flopped. It was terrible summer for movies. But stuff like Stranger Things on Netflix have done very well. Do you think that there’s any particular reason for that? Well, firstly, you’ve got a lot of great filmmakers working in that streaming, and it’s a great way to tell a story, take your time. I was a big fan of The Get Down. As a New Yorker that was here in 1977 as a boy, and I love Stephen Adly Guirgis, who was the writer on that, so I was very excited about it, and I loved it, and it was great. Even though it seemed like after Baz Luhrmann’s episode, it was still like sort of finding it’s tone, but the cast was so good and the writing was so good. Stranger Things, I’m a sci-fi fan, but like I said, I’m from New York, so small-town stuff doesn’t really – unless it’s Lynch. I’m very excited about Twin Peaks. Yeah, I will always watch, and actually, the Twin Peaks people are very into Stranger Things. I’m on a fan page, and they’ve connected the two, and I really want to get behind Stranger Things. It’s just, out of all the Stephen King books to reference, Firestarter seems like not the one I would reference. Well, it definitely also feels very like 80s Spielberg. Right, and I remember that year when E.T. came out and loving Poltergeist and not being so crazy about E.T. because I was from New York. I think it had something to do with it. Yeah, it’s funny actually because the night I went to see the first episode of From Cold Lake, I tweeted out that I wasn’t sure if I should expect Garrison Keillor or David Lynch, walking into this. And I don’t know either because we don’t have the next script yet. All I know is that it gets weirder. That is Lynchian enough. All I need to hear is it gets weirder, I’m cool. How long have you been working as an actor here in New York? I’ve been around for a while and then I took many years off, and I just came back about two years ago. What advice would you give to someone that’s looking to go into acting here in New York? Specifically in theatre. Well, Tracy Letts has a great 10 pieces of advice which he gives, which I agree with most of it. Not that I’m Tracy Letts, but I would say when I was a younger improviser, there was one theater. When I first moved to New York from Chicago where I lived for a long time, and I was doing comedy there, and there was a whole avant garde scene. There was this place called the Ontological where guys like Richard Foreman and Richard Maxwell were doing their work, and there was only really one improv theater. So the two would sort of funnel each other, like we were informed by the avant garde as much as we were about our comedy influences, so if you were going to do something like improv, go to a lot of plays. Do everything. Experience everything. Don’t just do that one thing would be my major recommendation. As an improv teacher, getting students to go read plays and see plays and let that inform how they approach the work is a challenge, more challenging now because there are so many improv theaters, but they’re all improv, improv, improv. Would you say that there are any specific plays or any specific performers coming up that really influenced you as a performer? Coming up? I mean, I like to think that I was an influence on people coming up, but as an actor, I remember seeing John Malkovich at Steppenwolf and thinking, “That’s the kind of actor I want to be.” That definite sort of ethos, that whole crew was like exciting to me, that Chicago style of professional yet seemed like anything could happen. It was a huge inspiration to me, and then guys like John Belushi and all those comedians I grew up adoring, Richard Pryor, Gene Wilder, may he rest in peace. That was an example of a guy who is hugely funny but an actor first. Yeah, that’s what Mel Brooks said to him! In Blazing Saddles, I think they had an old cowboy guy cast in the role – the one that Gene Wilder played – but he showed up drunk and couldn’t do the part, so they gave it to Gene who was totally miscast. I like actors like that, like Malkovich who should never be cast, Philip Seymour Hoffman, may he rest in peace, should have never really been cast. But they made it their own, you know. It wasn’t necessarily what you expected, reading it on page, but maybe it was even better. Yes, totally. I can’t imagine anyone else doing it. Especially Blazing Saddles. I mean, that whole cast, just amazing. If you lived in Cold Lake, would you rather be the town’s poet laureate, a general with the local war reenactors, or a fisherman who lost his thumb catching the biggest fish anyone has ever seen? Probably the poet laureate, yes. I’d need to be doing something artistic. I was talking with Colin about this, the sole artistic person in this town, how there is something beautiful and a little bit sad about it. Yes, there is. How does that person in the person, in the case of what we’re doing, how does she stay inspired? How does she grow, or is she just satisfied with simple stuff? But then why get into it in the first place? What would be your secret talent at the Cold Lake open mic night? What would be my secret talent or Bob’s secret talent? Sure, either one. Either, both. That’s a good question. Maybe Bob would be a poet or a juggler. He would be able to recite Eugene O’Neill monologues. Comedy, he could probably do some political comedy. National politics or local politics? Exactly! I would love to see someone like Bob have the opposite political point of view of what New Yorkers like me would expect he would have, like be very pro-Hillary. I wonder what Cold Lake – once again, I am definitely a New Yorker who’s got strong – as I’m sure many small town people think about New Yorkers – I imagine small towns, but then I’ll be in small towns, and I’ll be in shock that either people are racist or think God is speaking through them or something. One of the questions I asked people in the cast was is Minnesota a blue or a red state, and I hear it’s a blue state. It’s very divided. There are parts that are extremely liberal, but then there are these pockets of the state that are extremely conservative. Out of Minnesota, you can get Franken and Bachmann. That’s Minnesota right there. Yeah, Bachmann, what is up with that? (laughs) Craziness. Seriously, what is going on there? I improvise Saturday nights with a group called BBC2. I do a duo show with a guy called Brian McCann at the PIT. I teach at the PIT. I did a small movie that I guess is almost done called Baby Frankenstein. We shot that in Scranton, so I spent time in Scranton, which I think is in the top five – I think Pennsylvania is in the top five KKK states. Most of the others are Southern. When I got to Pennsylvania, there was a guy in the cast who was with me, and we were hanging out. We went to a restaurant, and he’s like, “Hey man, look at that car,” and there was a Confederate flag on the back. Confederate flags everywhere. Anyways, it was an interesting experience. I got to play a guy who is very much the sort of old-time idea of masculinity. Guns and mustache and orange vests. It was fun to play, but I was glad to get out of there. That’s very much what you’re doing with your character right now in From Cold Lake, very much about traditional masculinity. Do you expect that in the coming episodes that you might deconstruct that, or is that a character that is going to pop up a lot more? Honestly, I don’t know. I think from what I get is that he is sort of a tragic guy, and I think he genuinely loves his son. I’m hoping that whatever is going on, it’s sort of a beautiful understanding, of acceptance. I don’t really know. From what I understand, it’s sort of sad. I substitute teach in the next episode. Does that answer your question? Yeah, I mean, you don’t really know much at this point. I don’t, I have no idea, which I love. It’s like being on a series, written by a really smart writer that keeps you guessing. Have you seen The Leftovers? Oh, you should watch The Leftovers. It’s the best. It’s just the abundance of wealth in TV right now. It’s so difficult to keep up. A lot of good stuff but also a lot of bad stuff, so the opportunity is there to really do something interesting. I have lots of friends who are annoyed that MacGyver is coming back and all this stuff from the 80s, and I’m like, well, it’s because they need stuff. For every MacGyver, there is a Breaking Bad. Any good storytelling is up my alley. Thanks for making the time to chat with me today. Tickets are on sale now for From Cold Lake at the PIT Loft, located at 154 West 29th Street, and can be purchased online at ThePIT-NYC.com. Individual performances are $10 each or $45 for the entire run. For other questions or assistance with ticket purchases, call the PIT at 212-563-7488.